Discovered in the fifteenth century, although its discoverer is not known. 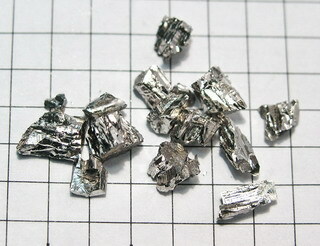 Bismuth is a brittle metal which is silvery in color with a pink tinge. It is stable in air and water. It has poor thermal and electrical properties and finds applications in the manufacture of fusible alloys, a range of materials with low melting points which are suitable for various applications including solders and thermal fuses. Pure bismuth shows a high absorbtion of gamma rays which makes it useful as a filter or window for these particles, whilst at the same time permitting the passage of neutrons.